The firm has been inspired by natural wood, stone and ancient ceramics in its new collections. The Nobu floor tile and the Mosa and Mood wall tiles combine with the volumes and lights to give greater scope to housings and projects in the contract sector. Exclusiveness and unique designs are the two axes on which Nobu has been structured, the new large size ceramic collection that Porcelanosa presents on the occasion of the 26th Global Architecture & Interior Design International Exhibition. Belonging to HIGHKER, Nobu brings the natural wood look back through its three colours: Natural, Arce and Roble. Qualities to which we must add the resistant characteristic of cutting-edge ceramics, which makes this material one of the best solutions for large establishments and architectural projects. This rectified porcellanato tile comes in the following sizes: 19.3cmx180cm and 29.4cmx180cm for floor tiles and there is a 19.3cmx180cm anti-slip version that gives greater resistance to surfaces with its anti-slip technology. Multidisciplinary and cosmopolitan elegance. "We have opted for HIGHKER, Premium large size ceramics, and for sustainability, one of the priority objectives. In our production processes, we apply methods and criteria that respect the environment. Hence, our firm commitment to Forest, the ceramic parquet made up of 95% recycled material. 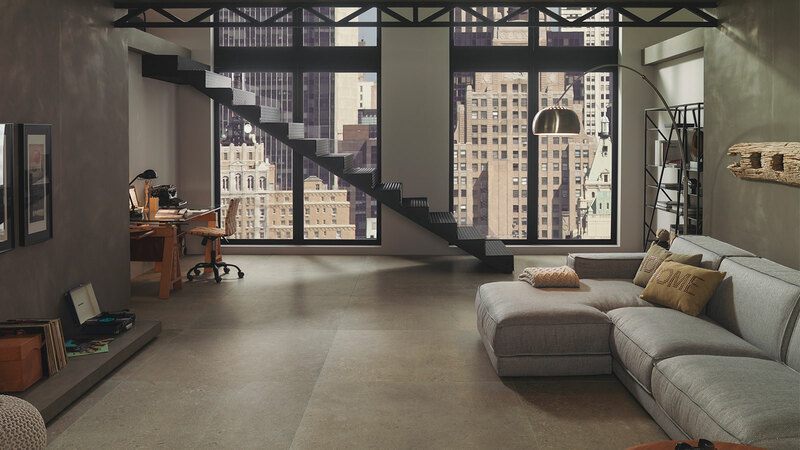 A solution designed for large areas, homes and buildings in the contract sector that join design with ecology ", explains Cristina Colonques, the PORCELANOSA Grupo's Director of Communication and Corporate Marketing. 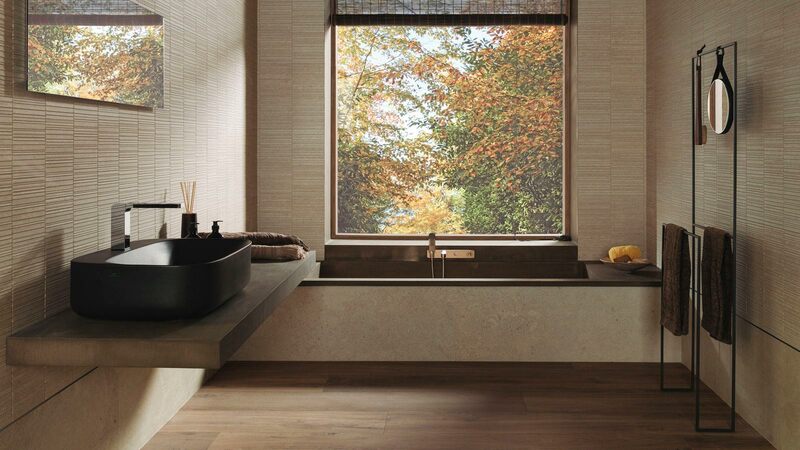 Inspired by the Meuse River and the natural landscapes through which its flows, the new Mosa wall tile presents a sobriety that balances the different areas in which it is included. Its Acero and Caliza colours present three sets: Stripe, Mosaico and Deco in a 45cmx120cm size. The new wall tile brings back palatial architecture from medieval Brittany. 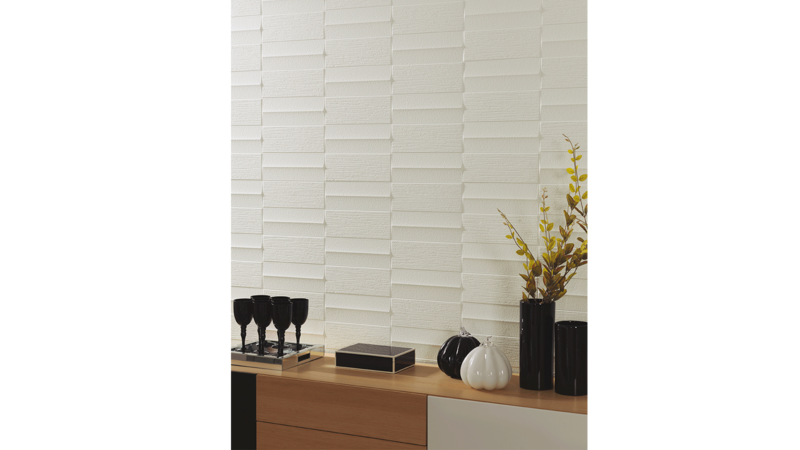 The Mood wall tile comes from ancient vases in Ancient Etruria (Tuscany, Lazio and Umbria), and from them it captures its volume and texture through white. With a 45cmx120cm size, the pieces that make up this collection bring greater harmony to the spaces. "We wanted to show all the possibilities of our collections with large atmospheres and areas. The custom-made design designed by us in our facilities places the product in a specific context and it allows the visitor to see all the elements that the PORCELANOSA Grupo has from different perspectives ", concludes Colonques.